We like to give each child space to work without being interrupted. This fosters concentration, completion, and the feeling of satisfaction that comes from successfully finishing their project. An individualized curriculum plan is implemented for each child. Having learned to work independently, the child will begin to explore the opportunity of working with others, confident in the skills they have acquired on their own. Lesson plans are assigned for Kindergarten and Lower Elementary children. An individualized curriculum plan in implemented for each child. We take the time and care that is needed to provide a wide range of advanced curriculum. Our curriculum is unique because it goes beyond learning through experience to add exploration of nature’s cycles and how they relate to our own lives. We believe that music, drama, art, and body movements are also important aspects of learning, growing, creating, and expressing. We provide activities such as dance class, swimming, tumbling, Spanish, clay work, and music. 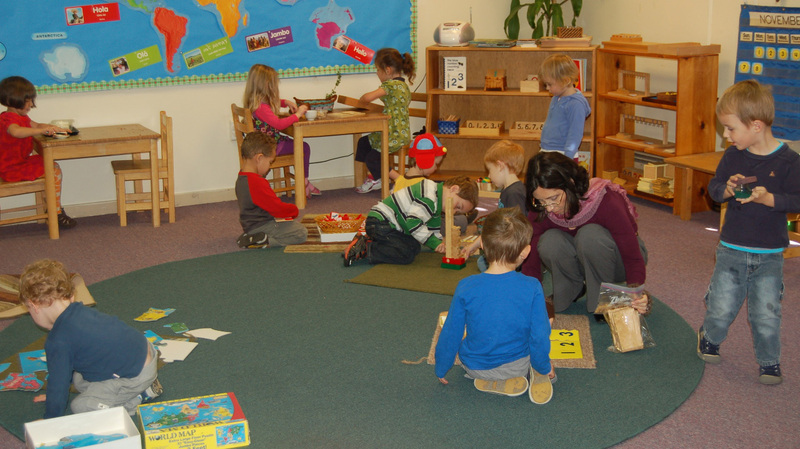 Toddler and Preschool groups may share combined activities, playtime, and lunch, but have individual work periods and projects. Kindergarten and Lower Elementary share scheduled activities, projects, recesses and gym, but have individual curriculum plans.